NEW! We are excited to announce our new fully recycled, fully recyclable cake boxes! 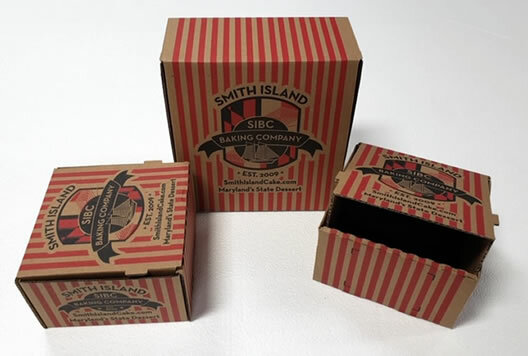 At the Smith Island Baking Company, we are proud of our people, our products, and your experience. No matter where your order is headed, we guarantee it will be as beautiful when it arrives as when we put it in the box. If you're not completely satisfied, just let us know and we'll make it right. Guaranteed! At checkout, select your desired FedEx shipping method and delivery date. Your order will arrive on that day, and in perfect condition, guaranteed. Every SIBC product is made from scratch with the finest ingredients, and shipped frozen with dry ice via FedEx. We ship Monday through Friday for delivery Tuesday through Saturday (we are unable to deliver on Sundays or Mondays). Place your order by 4:00 pm EST, and we can deliver the next day. Don't need it tomorrow? 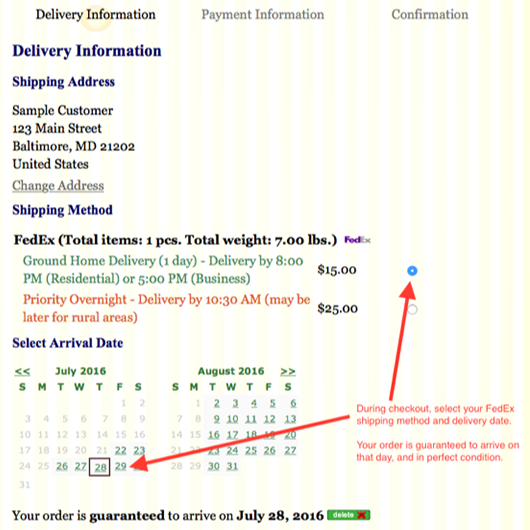 Select your desired delivery date and shipping method at checkout. You may receive your cake at your convenience and store frozen until you are ready to thaw and enjoy. Products may be frozen and refrozen as needed. At checkout, please choose the shipping method which best suits your needs. Please see the chart below for shipping rates based on your delivery location. Because our products arrive frozen, we recommend receiving your order at least a day or two prior to serving to ensure adequate time to thaw. Upon receipt, place the order in your freezer until you are ready to unwrap, thaw, and enjoy. Should you have more questions about delivery and shipping suggestions, please feel free to contact us directly. We look forward to serving you. Signature is not required. If you have more questions, or if you would like our assistance in scheduling your delivery, please contact us directly. We look forward to serving you. Upon placing your order, you will receive several notifications regarding your shipment, including status updates and shipping notifications. Should you still have questions or should you require further assistance, please contact us directly. Saturday deliveries to businesses and schools, including boarding schools and universities, is not available through FedEx Ground or Ground Home, and will incur a FedEx Saturday delivery charge. FedEx does not deliver to Post Office Boxes. We are only able to ship within the United States. We no longer offer international shipping, and apologize for the inconvenience. Hundreds of years ago, on tiny Smith Island in the middle of the Chesapeake Bay, the men would be gone for months at a time during the autumn oyster harvest. So Smith Islanders got pretty good at celebrating when they were together, and letting each other know they were missed when they were apart. The Smith Island Cake has become a symbol of togetherness. People seem to get busier and busier, but the desire to connect is as strong as ever. When our customers request mail order cakes from us online, and invite us into their special relationships for birthdays, anniversaries, or weddings, we take it extremely seriously. We know how much you care about the mother, that child, that husband or wife, that sibling, or friend. When we send a birthday cake, you ask us to go in your place, to be there when you can't, and we do so happily. We work tirelessly to make sure each and every package we ship is as perfect when it arrives as it was when we baked it. We use the latest technology and techniques to protect our mail order birthday cakes, to ship them to your door, so we can proudly and unconditionally guarantee it will arrive on time, that it will be beautiful, and that it will be delicious.